This month's image was taken on the 3rd of September 1977 - perhaps the last Saturday of the summer holidays. This is 40186 passing Aber on the 1D41 14:30 SO from Crewe to Holyhead. A similar shot appears on the Aber page, but this is still one of my favourites. The loco is in very clean, almost ex-works, condition, with all the multiple working and hose connectors showing their original colours. At this time, this was a Wigan Springs Branch loco. 40186 was withdrawn in December 1982, and cut up by 23rd March 1983. This train was one of the few summer Saturday-only trains to run to Holyhead, and ran from 2nd May to 1st October. 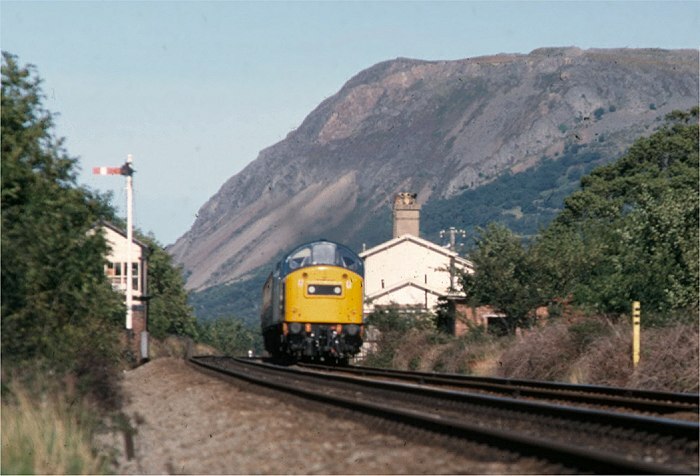 It was a regular class 40 turn, with a guaranteed thrash restart from the stops at Penmaenmawr and Llanfairfechan. The loco is still working hard as it passes the closed station, even though the train only consisted of 5 Mark I coaches on this run. Aber signal box opened on Mondays to Fridays and summer Saturdays to break up the section between Penmaenmawr and Bangor. On Saturdays, the signalman would switch out the box and end his shift as soon as this train reached Bangor. Nowadays, the box has been replaced by imtermediate block signals controlled by Penmaenmawr and Bangor signal boxes. All that remains is a ground frame to control the emergency crossover.